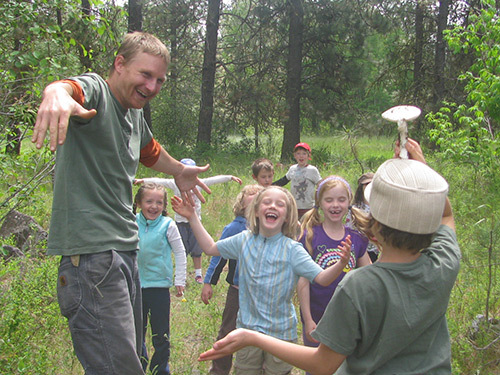 Twin Eagles Wilderness School is growing, and we have paid positions available for our upcoming 2019 Summer Camp Season. We have a strong reputation as a powerful center for passion-based deep nature connection in the Inland Northwest with positive mentoring relationships with the families and individuals we work with. Before applying, please take a moment to familiarize yourself with us. We're totally out-of-the-box compared to most environmental education organizations. Please start by reading our homepage. This will give you more of a sense of who we are. As you can see, "environmental education jobs" or "outdoor education jobs" don't really do justice to the experience of working with Twin Eagles. "Outdoor adventure jobs" get closer, but even that is still lacking. Passion based. People learn best when they are excited to learn. This is common sense, but unfortunately not so common in our modern world today. For this reason, we have a high standard that everyone at Twin Eagles truly has a passion to be here - students, volunteers, staff, everyone. Based in authentic, heart centered relationships. Working with Twin Eagles is not just a job, it's an experience in building relationships with a whole nature based community to expand consciousness. We open our hearts to each student, volunteer, and staff at Twin Eagles, and need that kind of full presence from each of our staff. If you work here, we will invest in you. Reciprocally, we'll need you to invest in us. More about inspiring, less about "teaching". Authentic education is an ongoing journey of discovery for the individual. That is why we use the word "mentoring" rather than "teaching". Good mentors inspire students through their own passion for nature connection, community building, and self discovery. Less didactic downloads, more inspirational storytelling. Less stream sampling, more swamp tromps. Less about what you're doing, more about who you're being. Develop Passion, Purpose, Gratitude, Confidence, and Leadership. Experience a Truly Inspiration Vision of Hope! We are looking to hire staff for the following roles at our very popular summer camps. We're offering paid positions based on experience, with accommodations & meals provided for overnight camps. Have a blast working in a powerful deep nature connection mentoring culture, and deepening your mentoring expertise while supporting a common Vision of restoring hope in today's youth. We're known for crafting a culture of authentic depth mentoring. Click on the links below for full descriptions. Please click on the above links for specific information about how to apply. Not yet qualified? Consider volunteering with us. It is an amazing opportunity that builds your experience while making a real difference in the world as you develop yourself. Click here for more information on volunteering. Stay updated about future job opportunities and more by subscribing to Twin Eagles free monthly eNewsletter.